What is An Electronic Voting System? Electronic voting is a system of voting that uses electronic methods to count and record votes. Some electronic voting systems use physical ballots that are then counted electronically, and others replace physical ballots with electronic voting machines. In some cases, voters are even able to cast their votes over the internet. Electronic voting works a lot like regular voting, but it's typically easier for the voter and less labor intensive for the government. Voters either fill out ballots that are scanned and counted electronically, or cast their votes by interacting with a voting machine via a touchscreen or physical controls. Since there are no ballots to count manually, fewer election workers are required, and it takes less time to finalize the results of an election. Voting in the United States is an extremely complex topic, because it's handled at the state and local level. Some areas still use paper ballots that are counted by hand, but most use some type of electronic assistance in the counting and casting of ballots. Some of these electronic voting systems have a paper trail as a hedge against tampering, and others don't. Some systems also transmit voting data over the internet in some way, while others rely on election workers and volunteers to physically transport voting machines, and the data they contain, once voting has closed. Optical Scan Voting Systems - These systems use physical paper ballots, which the voter marks in some way. The ballots are scanned and counted electronically, but a physical record of each vote remains. Direct Recording Electronic (DRE) Systems - These systems allow the voter to register their vote by interacting with a touchscreen, pushing a series of buttons, or rotating a dial. There may or may not be any physical record of the vote depending on the specific machine. Voting Over the Internet (VOI) Systems - These systems tally and transmit votes over secure internet connections. The vote itself may be placed on any internet-connected computer, or restricted to voting machines that are located at official polling places. Secure Electronic Registration and Voting Experiment (SERVE) - This was a system that allowed American expatriates and military personnel to register and vote over the internet. It was discontinued due to security concerns. What Are Optical Scan Electronic Voting Systems? These systems have been around for longer than any other type of electronic voting, and they rely on the same basic technology that's most commonly found in standardized testing. The voter will typically fill in a bubble, square, or arrow to indicate their preference for a candidate or measure. Optical scan voting systems are fairly common, because filling out this type of ballot is no more difficult than filling out a traditional ballot, but they are much easier to count. Instead of requiring election workers and volunteers to manually count each vote, ballots are passed through optical scanners. Some polling places allow each voter to scan their own ballot before they leave the polling place, while others require voters to place their ballots in a secure container. This container is later transported to a central location where election workers scan the ballots. In the event of hardware malfunction, or suspected tampering, the paper ballots are available for manual or electronic recount. What Are Direct Recording Electronic Voting Systems? When most people think of electronic voting, these are the systems that they think of. Unlike optical scan systems, DRE voting machines do not use individual paper ballots. 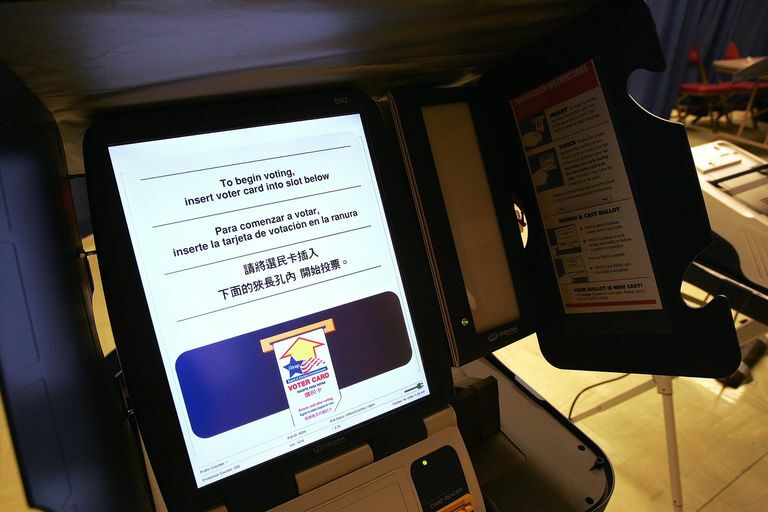 Instead, the voter interacts with a voting machine via a touchscreen, button controls, or a dial. Since there is no physical component involved in this type of electronic voting, some DRE systems lack a paper trail. These systems provide the voter with no record or confirmation that their votes were cast correctly, and there is no way to go back and recount. To help prevent tampering, some DRE systems are equipped with the ability to create a physical record of each vote that is cast. These voting machines typically print off a receipt for each voter, which they can examine to verify that their votes were tallied correctly. The receipt is typically retained inside the voting machine for purposes of verification and recounting. What is Voting Over the Internet? Voting systems that make use of the internet come in a few different forms. In some cases, the internet is used to transmit data from official polling places to a central server, and in others individual voters are able to cast their votes from any internet-connected computer. Some polling places have voting machines that are connected to the internet, and they use the internet to transmit voting data to a central location for storage and official tallying. This type of voting is similar to traditional DRE voting, but results may be available faster since election workers don't need to physically transport voting machines for the votes to be counted. Instances of voting over the internet that involve individual voters casting their votes remotely are less common. These systems typically involve each voter using a proprietary piece of software, or browser plug-in, to establish an encrypted connection and cast their votes. Internet voting is available in some countries, like Estonia and Switzerland, and has been tested in others. The United States rolled out a pilot program called Voting Over the Internet for the 2000 election, which allowed less than 100 people from around the country to cast votes securely over the internet via a Netscape Navigator browser plug-in. Some states have also allowed people to vote in primary elections over the internet. What is the Secure Electronic Registration and Voting Experiment? Following the success of the VOI program during the 2000 election, the United States instituted a second internet-voting test. The Secure Electronic Registration and Voting Experiment was intended to allow about 100,000 American expats and overseas military personnel to vote in the 2004 election over the internet. Prior to the 2004 election, the Department of Defense cancelled the program due to security concerns. Potential issues of anonymity and vulnerability to hacking were raised, and the program was sidelined until these problems could be sufficiently addressed. What Are the Advantages of Electronic Voting? The main advantages of electronic voting, when compared to traditional paper ballots, come in the form of increased efficiency and reduced cost. Fewer election workers and volunteers are required, because the ballots do not need to be counted manually. There is also no need to print physical ballots which represents a cost savings. In some cases, electronic voting machines are also easier to use. This isn't the case for all electronic voting systems, but they are typically easier to understand and use without accidentally voting for too many candidates, no candidates, or the wrong candidate, according to Stanford University. DRE voting systems are also easier to adapt for use by the blind or visually impaired, and voters with limited mobility or strength. Unlike paper ballots, DRE voting systems can be equipped with headphones for the visually impaired, and assistive technologies like foot pedals and sip and puff controls for people who are unable to use the standard controls. According to the Electronic Frontier Foundation, even optical scan voting machines can be equipped with these assistive technologies. Are There Any Disadvantages to Electronic Voting? The lack of physical ballots can be seen as either an advantage or disadvantage of DRE systems. Voter confidence suffers when there is no paper trail, since it becomes difficult to tell whether electronically stored votes have been tampered with. According to the Brennan Center For Justice at New York University School of Law, without a paper trail, votes could be lost or changed without the voter realizing. The other issue with DRE systems that lack a paper trail is that voters have no way to verify that their votes were registered correctly. For instance, if a machine is calibrated improperly, and the touchscreen input malfunctions, it could theoretically record votes for the wrong candidate, and the voter would be completely unaware. In order to address issues of voter confidence and concerns of potential fraud, some DRE systems have the ability to print a receipt and keep a physical record of all votes. This allows the voter to see that their vote was recorded correctly, and it can also create a physical record for the purposes of verification or recounting later on. The problem with printing out vote records is that, like traditional paper ballots, they aren't invulnerable to tampering. In the same way that electronic voting records are vulnerable to hacking, physical ballots have suffered from tampering, like ballot stuffing, for as long as elections have existed.